Orange you glad you did? When my kids were little they really loved knock knock jokes. This was the punchline of one of them.. 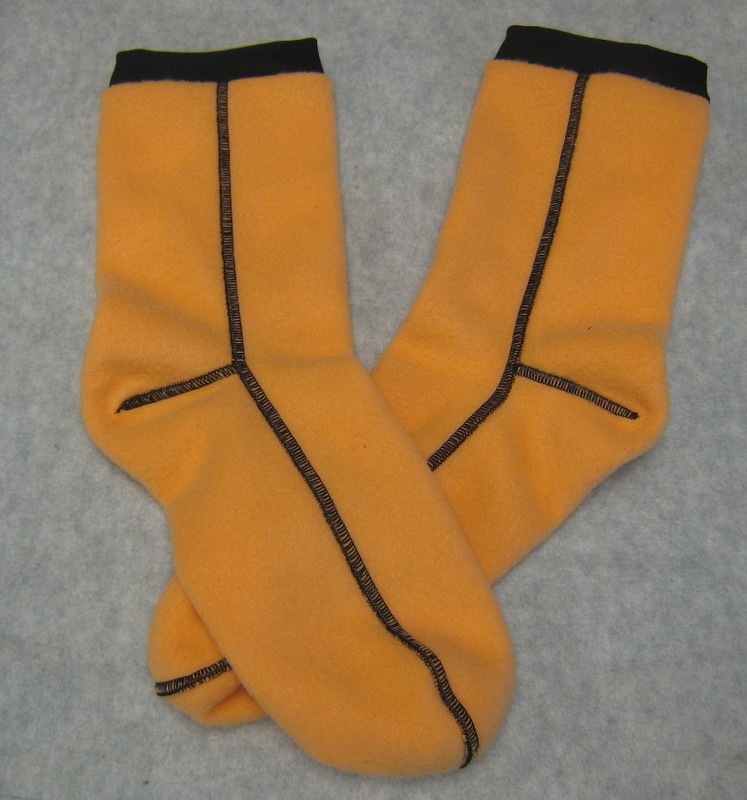 In this care,orange you glad you told me how to adjust the sock measurements because these will probably fit a bit better. 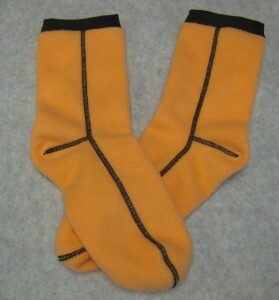 I talked to my victim friend with the cold feet and decided what adjustments we would like to make to the socks. I ended up making them a bit narrower at the front as he has narrow feet. I also lengthen the hight of the sock a bit so he could wear them inside boots without them rubbing. This is more vintage fleece. It seems like it might have been from an old Halloween costume although I can’t remember for sure. It really is a bit more cantaloupe colored than the picture shows. I found a remnant of some black swimsuit fabric when I was at Joann’s last week and it made perfect ribbing. It has a higher lycra content than ribbing so the stretch recovery and is better and it should not overstretch as easily. It also has a high cotton content so it should feel good on the legs. I normally wouldn’t use black thread either but it was on the machine and it’s close to Halloween so I decided you could wear them as part of a costume if you wanted to be a pumpkin. Also, I wanted to try the pattern adjustments and decided that once they’re inside shoes or worn around the house it didn’t really matter what the color looked like. The contrast is fine with me also and adds a bit of interest to plain old socks. 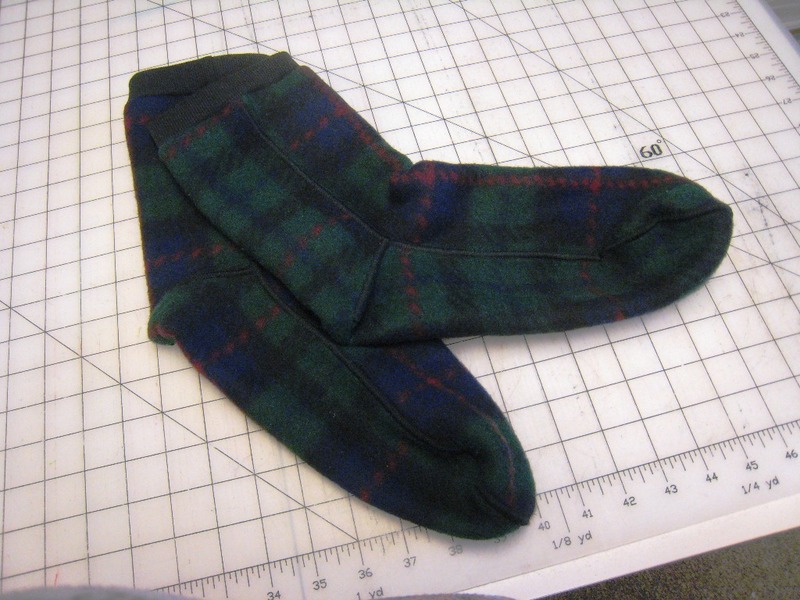 Many moons ago…or at least fifteen years I think, I was in a fleece sock making mode. I made big socks, little socks, lightweight socks, heavy socks, patterned sock and plain socks. Yes I had a great time. They were fast and easy with my new serger. When my family was no longer interested in fleece socks, I mean how many pair of fleece socks can a person wear, I gave socks to friends and finally had to give up the fleece sock adventure and move to something else. Now I’ve had one of those friends ask for new fleece socks. It’s getting to be fall and the feet are getting cold and the old socks have finally worn out. This was such a fun project. I went into the storage room where all the “vintage” fabrics and patterns are located and shopped. I located fleece and my favorite sock pattern. This is a Rain Shed pattern. The Rain Shed company is located in Corvallis Oregon so they really understand the local climate and needs. This pattern is very high quality, it fits well and is fast to sew. It also produces a professional end product which makes it very satisfying to sew. The first pair is done. Now the victim or I mean friend can come and test the fit and I’ll be inclined to sew a few more pair. 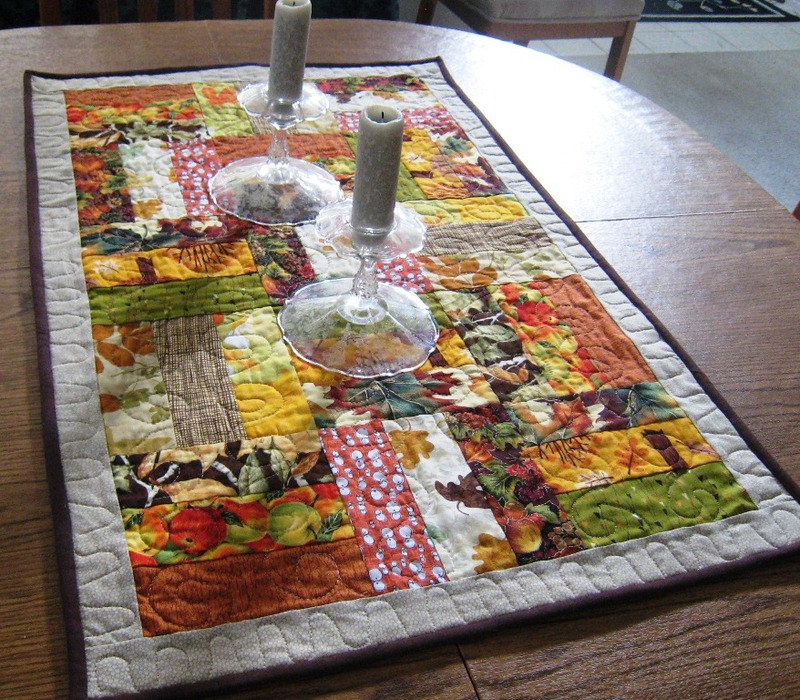 Fall table runner is finished. The fall table runner is finished and I think it looks ok. When I added the oatmeal colored border it really helped pull it all together. It gives your eye a place to rest among all the busyness of the patterned fabric. The dark brown binding really finished off the runner by framing the entire mini quilt. It think it was a good choice. I also decided to try my hand at free motion quilting. I traced a stencil on the middle portion and then just did a rounded zig zag down the sides. It’s far from perfect but for the first time I felt it was acceptable and not so bad I had to rip it out and start again. I figure it’s on the table for only a month or two and no one really looks at the stitching but only the overall effect. I know this is how people get better at a skill but I was lamenting to a friend that it’s hard to admit that at my age I’m really just a beginner. When people get older I think there is a tendency to think you should be able to master a skill the first time and not have to start at the bottom of the skill level. Sort of a humbling reminder I guess. I did have great fun doing the free motion quilting however and really look forward to finishing more projects so I can do it again. I think it’s time to finish up the x’s and o’s quilt and see how I do on that one.